The advert is one that I found online while browsing for electric cars. It is for the purpose of advertising the new electric car made by Volkswagen. The advert is incredibly simple, with a flat blue background to represent the sky, two tower blocks, a gas pump sign, an electric plug, a picture of the car, the name of the product, a little phrase to add meaning to the ad and the company logo. There are lots of signs in this advert, the iconic signs present in this advert, are of the gas pump and the electric plug which are not scaled directly in proportion the the iconic signs of the buildings. Possible indexical signs could be the lights within the room and the fact that it means someone is inside the room but you can’t see them. 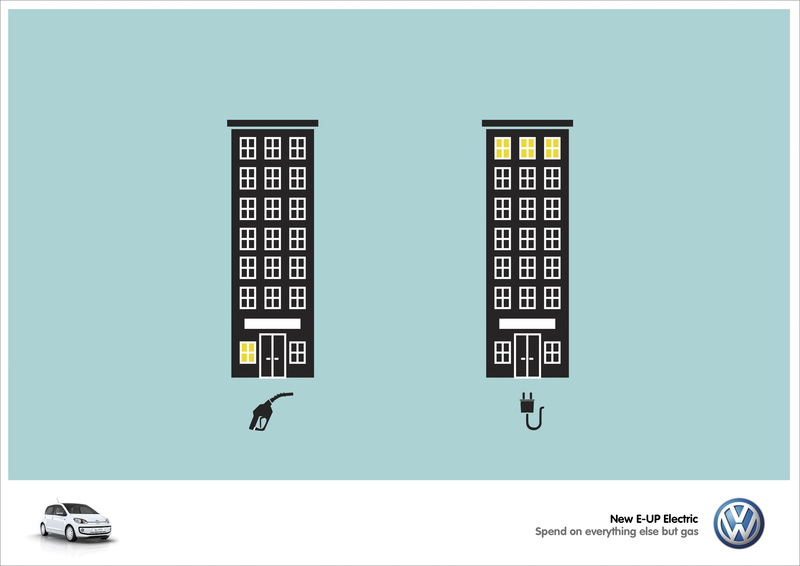 There is a caption on the bottom of the advert below the image, “Spend on everything else but gas” which essential gives the image more impact because it explains the fact that if you use an electric car rather than a petrol car you will save a lot of money, enough money to spend on things other than just fuel. On the left there is an image of the car with a shadow underneath that would almost appear as if there is a spotlight on the car, a small reflection under the car would indicate that the car is available in the showroom and ready for purchase (which it is, priced at £24,270). Volk is people in english and Wagen is Wagon in English also. The full translation of Volkswagen to English would mean PeopleWagon, a vehicle for the masses. Connotations of blue are expertise and stability and connotations of white are innocence and perfection. This indicates cool urban living with a luxury penthouse if you purchase the green energy powered car, rather than the financial struggle should you opt for the fossil fuel powered car.